© 2014 Jimmy Jewett. All rights reserved. The fall of the Tsar came as little surprise to most people. The month of February may have been the start of the final blow. Nationwide economic strikes, culminating in the strike of women textile workers on International Women’s Day. Nicholas got nervous, leading to him to send an order to dismiss the Duma, feeling it no longer had the power or will to protect the Tsar and old Russian Empire. This simply led to the reconvening of the Duma, the creation of Soviets across the nation, and the closing to Nicholas rule, which ended for good on March 17th, two days after the Ides of March. Following the abdication, things moved quickly in the capitol. The rule of the Romanovs over, a new provisional government was formed, made of the non-Marxist groups: liberal and conservatives headed by Prince Giorgii Svov. The biggest take away from the events following Nicholas abdicating the thrown was how it set up the opportunity for Lenin to move in come October. Different levels of society had incompatible goals during the months following the formation of the new government. High society wished to continue the war until victory and the peasants had grown tired of war. 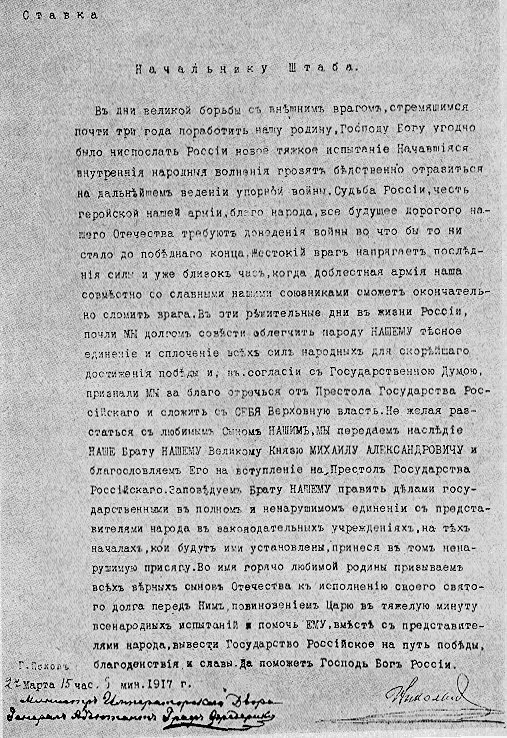 This distrust and disagreement between the classes would allow the Bolsheviks to use their early slogan of “Peace, Bread, and Land” to appeal to the larger lower class, helping them gain and maintain control of the government after their leader had not even been in the country as recently as September. While the Tsar by this point was losing influence quickly, his abdication along with the abdication by his son and brother officially ushered in a new era of Revolution in Russia, ending in the eventual formation of the Soviet Union. Great post Jimmy! I like how you put this event in context,. It seems to me like he had no choice but to abdicate after dismissing the Duma – the one body of government that “represented” the people. His views on the war also definitely did put him and the other nobles on a different footing than the peasants, which increased tensions. I like hw you connected this event and the weak government the Tsar’s abdication left to the October Revolution. The Tsar’s move to abdicate was a bold move for him to make while Russia was at war, but like you said he did it so Russia could hold together few just a little longer. This adds to the brutality of the execution of the royal family later that year, since they had basically “surrendered” to Russia political opponents. Good post! I really liked your links and the fact that you included his direct quotes; that made it feel much more authentic. It’s also interesting to read that he was so attached to the military and that this was one more tipping point that cost him in terms of popularity with the people. I wrote my post on the Constituent Assembly which was set up by the Provisional Government created after his abdication, so it was helpful to learn extra information about what happened before that. I like hearing about the time in between the fall of the Romanov’s and the beginning of the communist regime. Its definitely a part of Russian history I know nothing about and would love to know more. Great post!!! This post really makes the conflict of views on the war by Tsar Nicholas and the peasants clear. This conflict is a huge motivator for the revolution. This is a part of the history which is often rushed over and skips straight to the execution of the royal family. However this iterum period of change is a truly interesting time which shaped the formation of the new Bolshevik government and the Soviet Union. Great transition between imperial and post-imperial rule. It’s great to hear about the direct causes of the tsar’s abdication as well as the resulting political implications that led to the fall of the Provisional Government and rise of the Bolsheviks. I do agree with all the ideas you’ve presented for your post. They are really convincing and will definitely work. Nonetheless, the posts are very short for beginners. new to the whole thing. Do you have any points for beginner blog writers? This is a very interesting topic. I do not think that schools should have uniform but I feel like their are good arguments for both sides. I conceive you’ve got remarked some very intriguing details , appreciate it for the post. Wow, awesome weblog layout! How lengthy have you ever been running a blog for? you make blogging look easy. The total glance of your web site is excellent, as smartly the content! ©2011 Freezing in Siberia: 20th Century Russia. All rights reserved. Proudly powered by WordPress. Built with the AutoFocus II Pro Theme.